Though Fantasia didn’t perform as well as Walt Disney had hoped, it remains a testament to his exceptional cinematic genius. 200 min. Walt Disney Pictures. Directors: James Lgar, Bill Roberts (II), Hamilton Luske, Pixote Hunt, Hendel Butoy, Eric Goldberg. Cast: Leopold Stokowski (II), The Philadelphia Orchestra (II), Mickey Mouse, Deems Taylor, Leopold Stokowski, Steve Martin, Bette Midler, Itzhak Perlman, Quincy Jones, James Earl Jones, Penn Jillette, Teller, Angela Lansbury. Sight and sound are, of course, the basic building blocks of cinema, and Walt Disney restlessly searched for ways to maximize their impact. Disney pushed the envelope with 1940's Fantasia, an event film that introduced multi-channel sound to theatrical exhibition while artfully eschewing dialogue and sustained narrative in favor of a concert-like experience wedding classical music to high-flying animation. Though Fantasia didn’t perform as well as Walt Disney had hoped, it remains a testament to his exceptional cinematic genius. For a major mainstream release, Fantasia came awfully close to psychedelia with its astonishing variety of boldly colorful visual approaches. The film employs an ingenious blend of multi-plane photographic effects and traditional hand-drawn animation, put in service of eight short-film segments, including experiments in an abstract style—in particular, the opening segment to Bach's "Toccata and Fugue in D Minor." Depicted in unforgettable silhouette before a brightly colored cyclorama, music director Leopold Stokowski puts the Philadelphia Orchestra through its paces as music critic Deems Taylor provides interstitial commentary (in the version of Fantasia now in circulation, Taylor's introductions have been redubbed by voice artist Corey Burton). Following the Bach is a playful segment based on Tchaikovsky's "Nutcracker Suite Op. 71a," which strings together dances performed by various children on Mother Nature: "Dance of the Sugar Plum Fairy" (pollinating fairies, natch), "Chinese Dance" (mushrooms), "Dance of the Flutes" (ballerina-esque blossoms), "Arab Dance" (goldfish), "Russian Dance" (thistles and orchids), and "Waltz of the Flowers" (more fairies). Mickey Mouse takes the stage for Paul Dukas' "The Sorcerer's Apprentice," which becomes a narrative short with Mickey taking on the title role of a mischevious, hapless magician-in-training who lets enchanted mops and buckets get the best of him. It's considered the film's best remembered segment, and loosely inspired the recent Jerry Bruckheimer blockbuster for Disney. “The Rite of Spring” segment, set to Stravinsky, begins in outer space, zooms in to a planet in geological turmoil, and dramatizes the era when dinosaurs ruled the Earth before succumbing to extinction. An "Intermission" comes to an end with an opportunity to "Meet the Soundtrack," with the waveforms jiggling in line-drawn animation. Beethoven's "Symphony No. 6 in F, Op.68," the "Pastorale" serves as the basis for the next segment, "The Pastoral Symphony." A free adaptation of Greek mythology, the piece serves up Greek Gods (from Bacchus to Zeus), centaurs, pegasi, fauns, and Cupidian cherubs. Amilcare Ponchielli's "La Gioconda: Dance of the Hours" supports a segment featuring comically frolicsome ostriches, hippos, elephants, and alligators. Though primarily constructed of flights of fancy, Fantasia culminates in the striking, even terrifying “Night on Bald Mountain” sequence (set to Mussorgsky), paired with Schubert's comforting “Ave Maria”: a sort of vision of hell moving toward a vision of heaven. The film's musical and visual variety make for a unique, if potentially hit-and-miss, experience for viewers. Disney always intended to refrsh the film in reissues that would retain a segment or two while mostly presenting new material. Thus far that vision has yielded, thirty-four years after Disney's death, one return to the concept: Fantasia 2000. Fantasia 2000 proves a worthy successor to the original concept, allowing the next generation of animation talent to cut loose. This time, James Levine conducts the Chicago Symphony Orchestra, and the interstitials feature celebrity hosts—Steve Martin, Itzhak Perlman, Quincy Jones, Bette Midler, James Earl Jones, Penn & Teller, Mickey Mouse & James Levine, and Angela Lansbury—and though the tactic makes the film momentarily feel TV-sized, the intros are generally quite clever or charming. Again, the program begins with a study in abstraction, to Beethoven's "Symphony No. 5." Ottorino Respighi's "Pines of Rome" powers the segment, featuring flying whales, that's most like a poster you'd find in a Hallmark store, but if one's in the spirit of the proceedings, the nonsense can be quite beautiful. Gershwin's deathless New York-salute "Rhapsody in Blue" gets a segment cleverly modeled on the line-drawn art of longtime New York Times caricaturist Al Hirschfeld. Also a successful mash-up: Dmitri Shostakovich's "Piano Concerto No. 2 in F Major-I. Allegro" wedded to Hans Christian Andersen's story "The Steadfast Tin Soldier." The dancing-animals motif returns for Camille Saint-Saëns's "The Carnival of the Animals, Finale," here featuring synchronized flamingos (with yo-yos, no less: can you beat that?). "The Sorcerer's Apprentice" segment returns, followed by a sequel in spirit: Donald Duck as Noah's assistant, filling the arc to the tune of Elgar's "Pomp and Circumstance - Marches 1, 2, 3 and 4." Last up is Stravinsky's 1919 "Firebird Suite," inspiring a natural reverie about a wood sprite, and elk, and the pure force of fire. The new features in this set get the HD treatment. 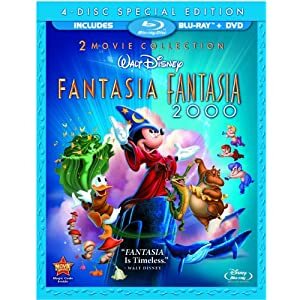 The Fantasia disc gathers some old and some new bonuses. In “Disney Family Museum” (4:05, HD), Walt Disney’s daughter Diane Disney Miller welcomes us into the Walt Disney Family Museum; also interviewed are Walt Disney Family Foundation president Walter E.D. Miller and the museum’s executive director Richard Benefield. In “The Schultheis Notebook: A Disney Treasure” (13:51, HD) Diane Disney Miller displays “the Rosetta Stone of special effects animation,” the newly discovered notebook of photographic special effects technician Herman Schultheis. Portions of the notebook are narrated and displayed, and Walt Disney historian J.B. Kaufman, animation historians Charles Solomon and John Canemaker, Benefield and Walt Disney Family Foundation director of collections Michael Labrie are interviewed. Also here is an Interactive Art Gallery, commentary by Disney historian Brian Sibley, original DVD commentary hosted by John Canemaker, with interviews and recreations of story notes by Walt Disney, and original DVD commentary by executive producer Roy E. Disney, conductor James Levine, Canemaker, and film restoration manager Scott MacQueen. The Fantasia 2000 disc includes a new featurette, the Oscar-nominated animated short "Destino," and the feature-length documentary about the short's creation as a collaboration between Disney and Salvador Dali. “Musicana” (9:20, HD) details a proposed but never realized Fantasia-esque project, with Solomon, Walt’s People author Didier Ghez, animator/writer/director Burny Mattinson, animator Steven R. Hulett, animator Dave Spafford, visual development artist Mel Shaw, The Lion King producer Don Hahn, and animator/sculptor Ruben Procopio. “Destino” (6:31, HD), wisely presented in HD. By virtue of BD-Live, we get access to Disney’s Virtual Vault, and the disc also includes original DVD commentary by executive producer Roy E. Disney, conductor James Levine, and producer Don Ernst and original DVD commentary by the directors and art directors for each segment. All in all, it's a set well-worth owning before these films return to the Disney Vault next year. All site content © 2000-2019 Peter Canavese. Page generated at 04/19/2019 12:53:56PM.